I finished my outline for The Free City last weekend and now I'm doing actual writing! I'm working from a previous draft, but making a point not to do any cutting-and-pasting; everything's getting typed in brand new. I'm into the second chapter and so far, it's going really well. Of course, the stuff in front is the most recent and polished; I expect the going will get harder as I move into shittier-first-draft territory. Thoughts on condensing three books (two and a half books, really, since I removed some gigantic digressions) into one volume: the trend today is towards longer and longer books, but I don't think that's my style. I'd like this book to be dense (as in lots of stuff happening in a smaller space), and paced on the faster side, more towards how a YA novel would be paced--though this is definitely for adults. Ninja training. Working. Petting the cats. Exciting, I know! I recently discovered the work of Katy Bowman, a biomechanical scientist (one who studies human movement). She blogs at Katy Says and also does a podcast of the same name, and is the author of several books including Every Woman's Guide to Foot Pain Relief and a brand new one called Move Your DNA which I can't wait to sink my teef into. So on her podcast she discusses how today's humans are "casted" (which means having our movement restricted, like having your arm in a cast ) in so many ways by modern society-- sitting too much is just the tip of the iceberg. One thing she talked about which I had never heard anywhere before, was how living indoors and spending a lot of time in front of computer screens, is like putting a cast on your eyes. When you're indoors, you are only looking at things up close, or at the most 20 or 30 feet away. The long-range part of our vision isn't getting used. What does that do to our brains, to our bodies, to our perceptions of the world? As writers, we spend an awful lot of time with our vision focused up close on computer screens or books. Not that these things are bad in themselves. But writers: don't forget to look at faraway things. Don't forget to gaze out towards the horizon--whether it's filled with buildings, trees, mountains or water. Don't forget to look at the sky. 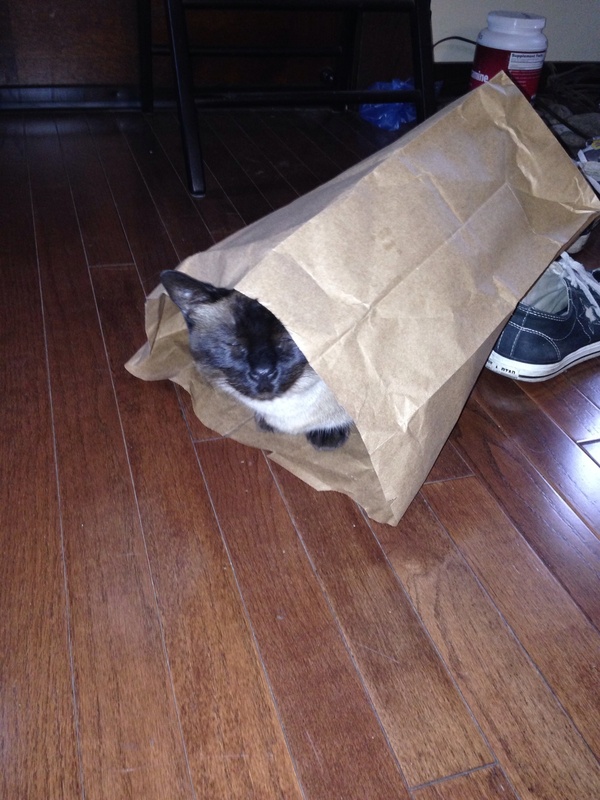 Random cat in a bag!